Making Lawn Ornaments In Wood, by Paul Meisel Lawn ornaments provide the perfect way to personalize your yard. These colorful wood decorations provide a cheerful touch and really make your yard stand out. This book includes all the tips and techniques. You will learn the best wood and plywood to use, the only paint you should ever use, an almost unknown technique that makes it easy to transfer the patterns to wood, the only jig saw blade you should ever use for plywood, an easy priming technique that, if not used, will ruin any outdoor project. 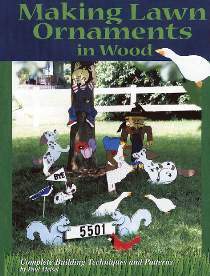 In addition to step-by-step directions, the book includes complete patterns for 38 different lawn ornaments. Only book available on the subject. All patterns are drawn FULL SIZE, some on several pages. You will see how to transfer the pages to your wood without photocopying or removing the pages from the book. You will even learn how to arrange projects to make interesting scenes in your yard. 130 pages, over 100 photographs and illustrations, 8 pages in full color, 9 x 12 paperback.